The Delaware Valley Regional Planning Commission uses a systematic process for managing traffic congestion and monitoring transportation system performance in the Philadelphia metropolitan region. Guided by an advisory team of stakeholders, the agency identifies congested corridors and sub-corridors in the region. It then determines the most appropriate multimodal strategies available to mitigate congestion and enhance mobility of people and goods. The agency tracks its progress in meeting its long-range goals through performance indicators, which it uses to evaluate what is working well in terms of minimizing congestion as well as to identify improvements the agency can make. Planned future enhancements to its process include increased focus on systems management and operations to better measure reliability, and strengthening its use of performance measures. The Delaware Valley Regional Planning Commission (DVRPC) is the metropolitan planning organization (MPO) and regional planning commission for the nine counties in the Philadelphia metropolitan region of southeastern Pennsylvania and southern New Jersey. The region has a population of approximately 5.5 million people and an area of over 3,800 square miles. Traffic congestion is a major problem in parts of the metropolitan region and factors such as land use patterns indicate congestion may worsen in the future. At DVRPC, the Congestion Management Process (CMP) helps guide the discussion of where best to invest in the transportation system to reduce congestion and achieve regional goals, especially in light of fiscal constraints. 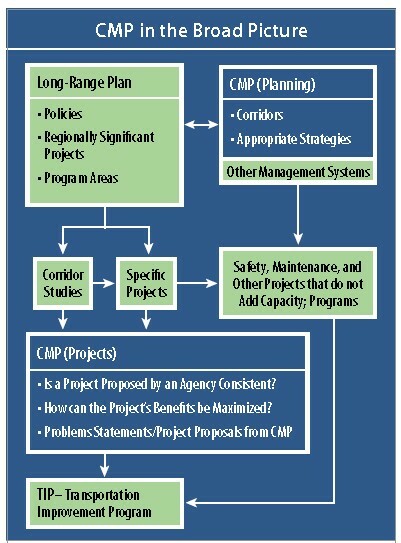 The CMP strengthens the connection among the long-range plan (LRP), transportation improvement program (TIP), corridor studies and other projects and enhances sharing of data, analysis, and completed studies. The CMP helps with Federal requirements for supplemental projects when road capacity is needed and tracks completion of these commitments. The 2006 CMP is currently being updated by DVRPC. Add new capacity where necessary, limiting the addition of new roads. These stakeholders are motivated to participate because the benefits for participating have been made clear by DVRPC. These benefits include shaping an effort that will end up affecting many other projects and investments, getting useful analysis and help with projects, increased visibility for adopted corridor studies to help recommendations get done, and improving mobility and quality of life. The CMP includes broader outreach efforts that help stakeholders by fostering knowledge of how individuals within municipalities and organizations can address congestion and advance toward shared goals. The CMP process (see Figure 1) begins with establishing guiding principles and agreeing on methodology. After discussion of available data sources and agreement on appropriate criteria, DVRPC conducts a region-wide analysis that helps identify congested corridors and sub-corridors. A variety of sections within DVRPC participate in this step, including operations management and travel modeling units. The selection of corridors and sub-corridors is refined with the input of the CMP advisory committee and additional reviews such as environmental, economic development, and quality of life. Congestion mitigation strategies are identified for the sub-corridors. A shorter set of priority congestion sub-corridors is developed and used for additional studies. Those efforts result in proposals for TIP projects. The CMP document outlines the implementation of congestion mitigation approaches and projects, which helps link the goals from the LRP to the TIP. Figure 1. 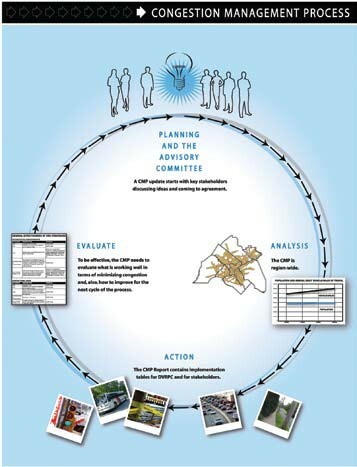 The CMP in DVRPC's planning process. Figure 2. DVRPC's Congestion Management Process is an ongoing process that involves regional collaboration, analysis, action, and evaluation. Source: Delaware Valley Regional Planning Commission. The CMP also includes a program for regular monitoring and evaluation of system performance. DVRPC believes that for the CMP to be effective, it needs to determine what is working effectively to minimize congestion and how the CMP has worked to improve planning for the next cycle. A challenge has been figuring out how to evaluate the effectiveness of completed projects. The performance and evaluation data from the CMP feeds into the planning process through the agency's broader effort at performance measurement: Tracking Progress toward 2030: Regional Indicators for the DVPRC Long Range Plan. Benefiting all residents in the region by ensuring ongoing improvements and integration among long range plan functional areas. Tracking Progress builds upon previous DVRPC efforts and is the product of technical work by the agency and guidance from the Tracking Progress Advisory Committee. To ensure the group had a strong foundation from which to begin Tracking Progress, DVRPC conducted a literature review of similar projects and studies. This included national studies and work by other metropolitan planning organizations, web-based materials and interactive sites such as the FHWA Performance Measurement Exchange, and other related efforts in the region. Based upon this research, DVRPC developed a draft set of indicators, which it vetted through the advisory committee. A safe, convenient and seamless multi-modal passenger and freight system that is sufficient in its capacity, attractive and affordable to its users, accessible and equitable for all citizens and visitors to locations throughout the region, and incorporates sound growth management, urban revitalization, environmental, and economic development planning principles. A broad challenge has been communicating why the CMP is important to the hundreds of individuals who need to buy into it for the process to work. Specific challenges have come from using many large databases of varying quality with differing data definitions. An outstanding challenge is using the power of computing to better select strategies and develop complimentary packages of solutions for congested corridors. DVRPC has not found a robust sketch-level program available to complete this required step in the CMP process. One lesson learned at DVRPC is that geographic information systems (GIS) help in the CMP. GIS improves understanding of available data, allows data to be analyzed in new ways, eases the process of updating information in the future, and helps create understandable and interesting graphics. The most important lesson DVRPC would share with others regarding the CMP or Tracking Progress is to start with a relatively simple approach so the task can be completed and have an impact. The next iteration can always be more sophisticated. As DVRPC moves through a second CMP cycle, it has found that the structure of the process has stood up well, although elements continue to be refined. DVRPC is especially interested in work with systems management and operations to better measure transportation system reliability. DVRPC continues to work on using performance measurements in Tracking Progress. The use of performance measures continues to strengthen at DVRPC, as does coordination among various projects. Delaware Valley Regional Planning Commission, Tracking Progress toward 2030: Regional Indicators for the DVRPC Long Range Plan, June 2006. Delaware Valley Regional Planning Commission, How the CMP Gets Us There, November 14, 2007. AASHTO/FHWA Workshop on Congestion Management, Presentation by Zoe Neaderland, Delaware Valley Regional Planning Commission, September 27, 2007.